Fried chicken is as vital to Texas history as the Alamo, but unlike the Alamo, when it comes to fried chicken, Texas wins. 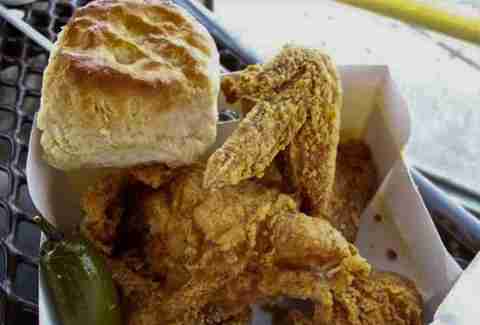 Nearly anyone born and raised in the south has a Granny/Mimi/Nana who can cook some damn good fried chicken, but for those times when they aren't available, here are the best spots to get your fried poultry fix in Houston. Generations of Houstonians have been able to enjoy The Barbecue Inn’s family charm and Southern taste. 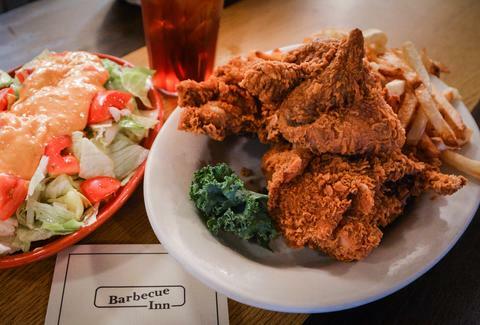 Their family recipes have been honed and perfected over the last 70 years, including some seriously mind-blowing fried chicken, which isn't even the most sought-after menu item (that title goes to the fried shrimp). But sometimes only bird will do, and this one does beautifully with a homemade batter that crisps up perfectly around an impossibly juicy interior. Frenchy's puts a creole twist on their menu, which includes boudin, red beans & rice, and jambalaya. It also includes some impressive fried chicken that's always accompanied by a tasty jalapeño. If you've been to one of their many Houston locations, you've likely experienced a long line, and the feeling (as soon as you take a bite) that said line was worth it. This makes sense, as they've been perfecting their game since the original location popped up on Scott St in 1969. From longhorn purse holders under the bar to a trophy peacock on the wall, this place screams Southern. Chef Brandi Key has developed a delicious menu inspired by all stretches of Southern cooking. They've got fried oyster BLTs, pickled Gulf shrimp, and a biscuit bar with toppings like crawfish etouffee. But of course, you can’t leave out the option developed by her ancestors: fried chicken. They encourage a family-style dinner, and you can choose a half-bird or full-bird, but either way, Grandma Pat's crispy buttermilk preparation will have you salivating before you even notice you've been given sides of biscuits, horseradish mashed potatoes, and red-eye gravy. 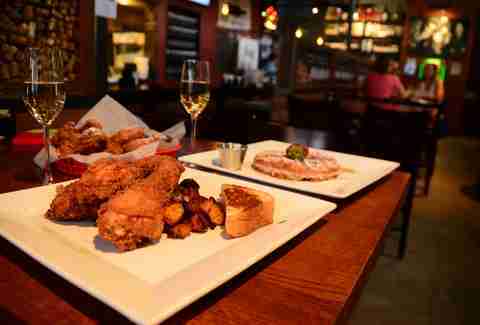 With two locations inside the loop, Max’s Wine Dive is making a tasty name for itself on the fried chicken map here in Houston. 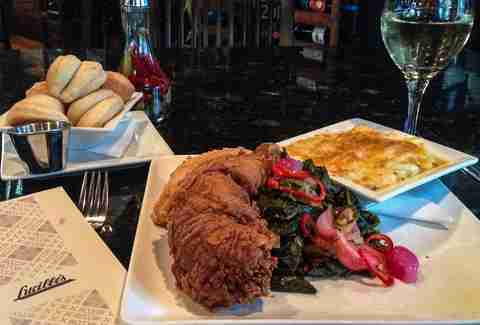 Dimly-lit, and with an ambiance that tempts you to stick around for "one more drink" (or two more bottles of wine), the place also keeps you coming back with a Southern-style menu that'll have you licking the grease off your fingers. The hard part is picking between the jalapeño-buttermilk marinated fried chicken with home fries, collared greens & Texas toast, or maple-glazed donuts & chicken wings. The easy part is saying "f*** it" and choosing both. 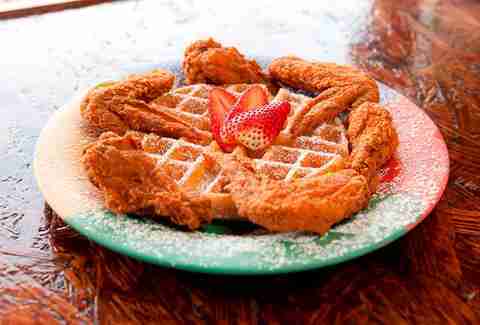 Who knows whether it’s the exclusivity of this fried bird or the fact that its just DAMN GOOD that brings the crowds. 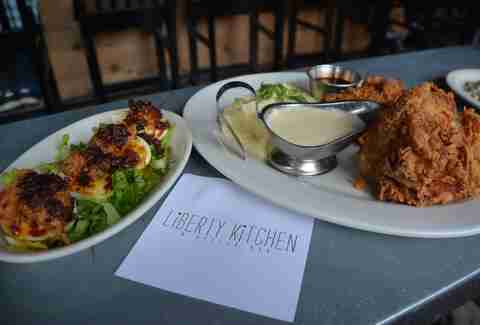 Probably both, but the fact remains that if you make it into Liberty Kitchen on Wednesdays for their fried chicken special, you'll probably want to come back with more friends next Wednesday. Accompanied by homemade hot sauce syrup and smashed potatoes & gravy, this perfectly prepared bird will make you want to get up and demand the recipe (which will not work). Although the full bird isn't available daily, you can nab some extremely tasty fried chicken sliders and also (yep) fried chicken deviled eggs. How did a breakfast place land a spot on this list? Because this breakfast place fries chicken, puts it on top of a fried waffle, and then fries your tastebuds off with sweet and savory amazingness. Do yourself a favor, and add some grits into the mix while you're at it. Don't mind the clown who may or may not be making balloon animals while you wait for a table. This chicken-frying establishment was named after the chef/owner's great-grandmother, Lucille, the first African American businesswoman in Texas. Chef Chris Williams serves Southern-style dishes with European twists, to make his food both familiar and unique. Freshness is key, and they prove it with a backyard garden that supplies much of their produce. 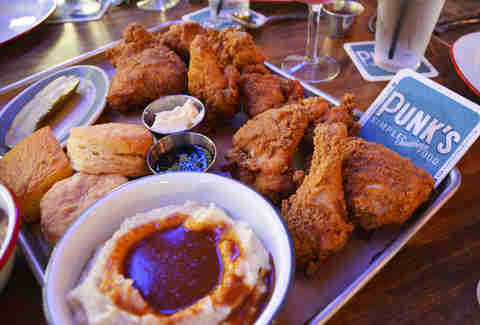 When it comes to the fried chicken, or "yard bird" as they call it, freshness is not spared. Organic and slow fried to perfection, the yard bird is served with garden-grown, smoked collared greens, mac & cheese, and a bourbon pickle... 'cause everything is better with a pickle. Throw in some hot rolls and some blue crab beignets and you have yourself quite a meal.